Polaris, one of the few restaurants that came up in St. George in recent times, has replaced the earlier Carriage House Restaurant. The original restaurant was opened in 1970 and had closed down recently. The new owner Abdul Amjath has moved his restaurant Polaris from its earlier location of St. George's Dinghy & Sports Club's lower level to the new location at the Carriage House. Although he has done some renovations, he has retained the original ambience & decor, which was so popular with the locals. The owner Amjath looked for his first job in the original Carriage House Restaurant when he started his professional life. And now he is running the restaurant himself. 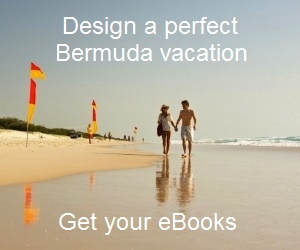 Polaris is located next to the St. George's Harbor and the view from the porch or a window-side table is wonderful. It's located at the Somers Wharf area. The restaurant is quite airy and with high ceiling and casual relaxed ambience, it makes a pleasing dining experience. Earlier Carriage House used to be a warehouse. The walls inside are made of bricks. When the horse carriages were removed from the streets of St. George, this is where the carriages were stored initially, and therefore such name of the building. It serves nice Bermudian cuisine, seafood and has added Sushi to its varieties. The restaurant boasts of fresh local fish and lobsters, and also claims to make all dishes from scratch. They use only certified Angus Beef for their beef selections. The overall food theme of the restaurant is to serve a mix of local food, including fish and lobsters, with steaks and prime cuts of beef and also sushi - all at reasonable price. They prepare the fish chowder really well. Other nice starters include deep fried calamari, tiger shrimp appetizer and Polaris salad. The local fish is grilled or roasted and served with vegetables and roasted potatoes. The 1/2 lobster or the thermidor dish is excellent and served with drawn butter, vegetables and baked potato. If you are looking for fast food, they serve nice burgers, sandwiches, wraps and fish & chips as well. There is also a Sunday brunch served here. Other than a fully stocked bar, they have nice selection of wine, as well as flavored tobaccos (hookah) and cigars. The beer here is probably one of the cheapest in the island. 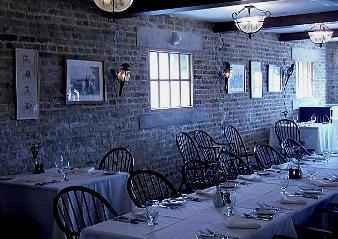 The dining room in Polaris can be booked for private parties and occasions with accommodation for up to 120 people. The outside area can be booked in the evening for up to 80 persons and the porch area can be additionally used for live musical entertainment. They accept credit cards. Dress code is smart casual. For dinner, reservation is preferred. Update August 2014: Polaris has closed down. A new restaurant Tempest Bistro has come up here and opened by the same owners who operate Mad Hatters in Hamilton City. Soups & Salads: $8-$12, Appetizers/Starters: $12-$22, Main Courses: $20 to $50. Lunch from 12noon to 3:30pm. Dinner between 5:30pm and 10pm. Brunch from 11am to 3pm. Happy hour on Friday between 5pm and 7pm. There is a barbecue every Wednesday during the season. Take Bus #1, 3, 10 or 11 from Hamilton to reach St George (Kings Square) from Hamilton. From there its a walking distance. From dockyard there is a direct ferry to St George (between April to early November). You can then walk down to the restaurant. 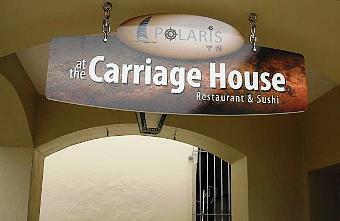 Polaris Carriage house was great service, and good food. I met the owner and we sat right on the water. Bill was $132 for 2 of us. Was worth it. Really liked the atmosphere and staff.